My wife and I just returned from a wonderful trip to Spain. On past travels it seemed that I couldn’t avoid interfaith family issues; this time was no exception. We had noticed that a lot of the items on tapas menus were ham, so we told Luis that we didn’t eat ham. When we said it was for religious reasons, he said that he probably had Jewish ancestors – the name Bofill was a common Jewish name when the Sephardic Jews of Spain were forced to convert or be expelled in 1492. I really liked Luis – and wondered if it was because he had Jewish ancestors. It’s not the first time I’ve thought that way. My college roommate, with whom I’m still close, who never met a Jew before college, had a Jewish grandfather, and I used to wonder if that’s why we got along so well. But I’m conflicted about thinking that way. Traditionally, Jews are supposed to feel connected with, even responsible for, all other Jews. That feels like it could be unequal and discriminatory and could set up a conflict in an interfaith relationship with the partner from a different faith background who presumably isn’t going to feel the same way. Or maybe it’s okay to feel an affinity with people who are part of your group without feeling that your group is superior or exclusively connecting only with people in your group. 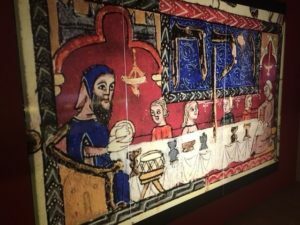 We went on a day trip to Toledo to see what had been the Jewish quarter and specifically the Museo Sefardi (as well as El Greco paintings in several locations – I really like El Greco paintings). The museum is housed in what was a synagogue built in 1355, but it did not have explanations in English of what is on display, and the audio tour didn’t work well. That was just disappointing. I had a much stronger negative reaction at the other former synagogue in Toledo, the Sinagoga de Santa Maria La Blanca. I knew that it had been turned into a church, but I didn’t expect to see a small exhibit in a side building that appeared to be promoting some form of so-called Messianic Judaism. I don’t understand Spanish, but there was a poster with a lot of Hebrew and obvious Jewish symbols surrounding a drawing of what looked like Jesus, and there was a man at the door wearing a monk’s robe and a wooden crucifix with a Star of David on it. I’ve always had a strong visceral negative reaction to Messianic Judaism – I call it “so-called” because I don’t consider it Judaism at all. It’s just not Jewish to pray to Jesus as the messiah and son of God. It added insult to injury to find it in a place where Jews had a long relatively peaceful history, until they were expelled. In Barcelona our hotel was steps from what had been the Jewish quarter and we saw a very small but nice exhibit at what had been the “Sinagoga Major.” But I have to say the highlight of our stay in Barcelona was a tour of the Sagrada Familia, the cathedral designed by Antoni Gaudi. The cathedral is famous for still being under construction after almost 100 years. But the interior is completed, and it is simply awesome, a vast stark space with an incredibly tall ceiling, beautiful stained glass in abstract patterns, unlike anything I’ve ever seen before. 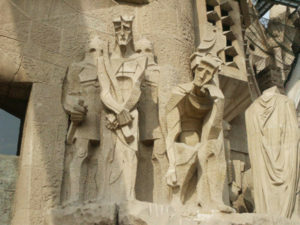 The cathedral has two finished facades, one about the birth of Jesus designed by Gaudi himself, and one about the death of Jesus designed by Josep Luis Sert – which is where the dismay happened. Our guide gave an excellent tour, but at the end, when he was explaining what the sculptures depict, he said the Pontius Pilate looks disappointed, resting his chin on his hand, because he asked “the Jews” what they wanted to do and “the Jews” wanted Jesus crucified. When the tour ended I approached the guide and said I thought what he said was contrary to the Catholic church’s changed doctrine that no longer blames “the Jews” for killing Jesus. He said he was aware of the doctrine, asked if we were Jewish and said he was glad we were there, and agreed to change his wording. That made me feel hopeful. We went to Girona, again specifically to see a Jewish museum – the Museu d’Historia dels Jueus. This one was an excellent exhibit – including explanations in English. When we left my wife, who converted after thirty years of marriage, said something about not having realized the depth of the discrimination the Jews of Spain suffered and how awful the forced conversion, expulsion, and subsequent Inquisition must have been. She was upset. It wasn’t new to me – I’ve known the basic history for a long time – and I didn’t have that emotional reaction. But it made me wonder what role Jewish history plays and will play in the future with interfaith families. I think some Jews are motivated to engage in Jewish traditions in part because Jews did so in the past in the face of a long history of persecutions, and I think that will continue to be true in the future. But I think that partners from different faith backgrounds can also find that history compelling and feel the same motivation. There has to be something very valuable and powerful about Jewish traditions for people to have maintained them in the face of tremendous adversity. I was very moved by one panel about “the Jewish family” in the fifteenth century. Even though its description of the roles of the father and the mother were very old-fashioned (what you would expect about the fifteenth century), when it said the children “are taught the customs and history of their people” – I thought that was timeless, and still important, including and perhaps especially for interfaith families. Does the huge conversation about Rachel Dolezal, who resigned as president of the Spokane, WA, chapter of the National Association for the Advancement of Colored People after it was revealed that she identified as African-American while her parents are White, have any relevance to efforts to engage interfaith families in Jewish life and community? I’m not commenting on Dolezal’s conduct or its implications on race and race relations; Samuel Freedman addresses those issues and describes her as “clearly disturbed” in the Forward’s “How Rachel Dolezal Crossed the Line from Solidarity to Slumming.” Dolezal’s claim to be transracial has also been criticized as demeaning to people who are transgender, which I certainly don’t mean to be. As the wife of an African-American man and the mother of three biracial children, I feel much more personally connected to cases of police shootings, racial profiling and the academic achievement gap for minority children than I ever did before my marriage. Would I self-identify as black? No. Never. That would be insulting, in my opinion. (I believe even wearing ceremonial clothes of another culture is pretentious, though many would disagree with me.) But do I feel black? Sort of. So Alina Adams doesn’t “self-identify as black” but she “sort of” “feels black” while her husband sometimes includes himself when talking about Jews, and his wife and their children’s Jewishness has become a part of him. I don’t think so. I don’t think coming up with categories or labels for people like Alina’s husband is helpful. Over the years, some people have suggested calling a supportive partner from another faith tradition a “ger toshav,” a Biblical category that literally means “stranger in the camp.” But the motivation is usually to allow people who fall into the category to participate in more Jewish ritual than those who don’t, and I think that’s a bad idea. I know that some people would say that it doesn’t make sense to talk about “transJewish” because a person who comes to identify as Jewish can convert. But as of now there’s no civil or cultural conversion, only religious conversion, and in any event there are many people who feel sort of or partly Jewish who for many reasons aren’t interested in converting. But the notion of a person who is born with and/or raised with one identity, who feels an affinity with and eventually adopts in some fashion a different identity—that’s what strikes close to home. There are many people who were not born or raised Jewish, who are married or partnered with Jews, who feel an affinity with Jews and Jewish traditions and who in some fashion adopt a Jewish identity, the way Alina Adams’ husband has. The increasing understanding that that kind of identity shifting happens is the positive implication of the Dolezal incident for those interested in engaging interfaith families Jewishly. My primary takeaway from the incident and my family’s own experience is that, apparently, identity is much more complicated than my husband and I ever imagined it would be before our kids were born. And that instead of having all the answers, we’re going to be learning right alongside with them—and the rest of America. In the Sunday New York Times on June 21, 2015, there is a letter to the editor from Ron Brown of Brooklyn, who describes himself as a Christian married to Jewish woman for 30 years, with adult children who identify as Jewish. The 2011 Jewish Community Study of New York, released in June 2012, has important findings for all those interested in engaging interfaith families Jewishly. The study confirms that there is a huge amount of intermarriage, and it is continuing. Between 2006 and 2011, one in three non-Orthodox Jews who married, married someone who was not Jewish (a 33% individual rate of intermarriage); 50% of the non-Orthodox couples formed were intermarried couples (a 50% couples rate of intermarriage) (135).1 Twelve percent of the children (age 0 to 17) in Jewish households — 50,000 children — are in intermarried households (183). The study reports that 31% of the children of intermarried households are raised Jewish and 11% are raised “Jewish and something else,” while 13% have parents who are undecided and 46% are raised not Jewish (180-81).2 A goal of having more than 50% of intermarried parents raise their children Jewish is reachable — if the undecided parents and the parents raising their children Jewish and something else can be influenced towards more Jewish choices. The tone of much of the study follows an approach consistently taken in the past by Steven M. Cohen, the study’s principal author, that lumps together all intermarried couples and then highlights their relatively low levels of Jewish engagement when compared to all in-married couples. The policy implications of this approach are that it is not worth making efforts to engage interfaith couples. A different approach, which compares those intermarried couples who are Jewishly engaged with in-married couples, highlights their relatively comparable levels of Jewish engagement; the policy implications of that approach, which is reflected to a degree in the study, are to make efforts to move more intermarried couples to Jewish engagement. For example, the study reports that the children of intermarried households receive relatively little Jewish education — only 35% are sent to supplemental school; but of the 15% of intermarried households that are synagogue members, 90% send their children to supplemental school. The policy implication clearly is to try to influence intermarried households to become synagogue members — and the study does say, somewhat reluctantly, “Perhaps expanding congregation-based efforts to engage intermarried households is worth pursuing” (28). For another example, of intermarried households that are raising their children exclusively Jewish, 54% score high or very high on the study’s index of Jewish engagement (182).3 The policy implication clearly is to try to influence intermarried households to raise their children as Jews — and the study does say that the fact that 13% of intermarried parents are undecided about how they are raising their children “suggest that communal efforts to engage intermarried couples should support efforts to raise Jewish children” (28). For another example, the study reports that the intermarried are less engaged because they have fewer Jewish social connections, with 77% of those age 30-39 living fairly isolated from other Jews — but adds, “These patterns suggest one approach: connect the intermarried socially to other Jews” (162). The study’s authors ask an important question: “To what extent has the Jewish community made progress in closing the engagement gap associated with intermarriage?” Comparing their findings to those of the 2002 community study, they conclude that the intermarried (again lumped all together) became more distant when compared to the in-married (140). Given the negligible communal efforts to engage interfaith families Jewishly since 2002, the lack of progress should not be a surprise. But a related finding exposes widespread negative attitudes about intermarriage that potentially result in disinviting, unwelcoming behavior: high percentages of parents say they would be upset if their adult child married someone not Jewish who did not convert. While 6% of intermarrieds and 12% of converts would be upset, 56% of non-Orthodox in-married Jews would be upset. Feeling that the fact of their relationship is a cause of upset in a community is a factor likely to discourage a couple from engaging with that community. Sensing negative communal attitudes may explain why more intermarried households make charitable contributions exclusively to non-Jewish causes, and fewer give to Jewish causes (203-05) — and the study does suggest “experiment[ing] with new ways of connecting with those who seem the most disconnected from communal Jewish philanthropy — [including] intermarried households” (30). The fact that people go where they feel welcomed is supported by another study finding, namely a significant shift of Conservative Jews to Reform, which clearly has been perceived as the more hospitable movement for the intermarried. Of all Jews raised Conservative, 29% now identify as Reform; of all now Reform, 31% were raised Conservative (124). The study has a very helpful discussion of the current context of shifting identities. It highlights fluidity, with people freely choosing identities based on relationships; malleability, with identities changing over time; and hybridity, a confluence of multiple traditions that is the ethos in American society generally (111-12) . One aspect of hybridity briefly mentioned in the study is that in 9 of 10 intermarried households, synagogue affiliated or not, Christmas is celebrated by a household member. The study states that “In about half, it is celebrated as a religious holiday” but provides no explanation of what that means. InterfaithFamily’s eight years of December holiday surveys have consistently reported, in contrast, that high majorities of interfaith families raising their children as Jews celebrate Christmas but not as a religious holiday. The Jewish Community Study of New York report can be found at ujafedny.org/jewish-community-study-of-new-york-201. The study may understate the amount and the Jewish engagement of what have commonly been thought of as intermarriages. Five percent of study respondents were people who had no Jewish parent and had not formally converted, but identified as “Jewish by personal choice.” A marriage between a Jew (by birth or formal conversion) and such a Jew by personal choice has up to know been thought of as an intermarriage, but the study appears to count such couples as “conversionary, in-married” — resulting in less intermarriage. Moreover, Jews by personal choice almost by definition would be more Jewishly engaged than non-Jews; if marriages involving Jews by personal choice were counted as intermarriages, that should mean more Jewish engagement by intermarried couples than this study, which treats those couples as in-married, reports. Many of the study’s findings are organized around an index of Jewish engagement, based on twelve factors selected by the study’s authors (118), and the study frequently refers to intermarried households scoring low on that index — for example, 70% of the intermarried score low on the engagement index (142). The authors acknowledge, however, that indicators that can be undertaken individually or with friends and family, that don’t demand formal affiliation or collective action, are not included in their engagement index (119). As intermarried households are more involved with these indicators that are not included on the study’s index, their Jewish engagement is understated by the index. I had a very interesting interview with Cokie and Steve Roberts last week. We talked about their new book, Our Haggadah, which I’ve blogged about before, and which our Board member Rabbi Rim Meirowitz reviewed very positively. I asked the Robertses what their goals were in terms of what they hoped interfaith couples would do with Our Haggadah. Cokie Roberts, a serious Catholic, said her goal was to make it as easy as possible to participate in and host a seder. She said Passover is a joyous festival, but people are intimidated about preparing for it, setting the table, and conducting the service. As I’ve said before, I applaud Cokie Roberts for being so supportive of interfaith couples engaging in Jewish practices like the Passover seder. I asked whether they thought that interfaith couples would still be having seders twenty or thirty years from now, and both were quite certain that they would. Steve pointed out that seders have been conducted for thousands of years, and Cokie said the seder is joyous, addresses universal themes, is home based (avoiding the barriers that synagogues sometimes present), and personally customizable. But my question posed the issue that I really wanted to explore – the interplay between Jewish identity and Jewish practices. Because if interfaith couples don’t identity their families, or their children, as Jewish, then in another generation, will the children of those families, themselves married, perhaps intermarried – will they still be interested in conducting or participating in the Passover seder? But that raised the identity/practice question again. Steve said his goal in writing the book was to provide guidance, models and encouragement to the many young interfaith couples that he encounters among his students. The model the Robertses themselves offer is to embrace both religious traditions. They said that choosing one religion, “ceding” to the other, wouldn’t work for them, because each was so deeply tied to their tradition. So my identity/practice question is still pending. The Robertses said they don’t talk about their own children’s identity or practice, I assume out of respect for their privacy. It sounds like the Roberts’ seders are so wonderful that their children would want to continue to have them for their families. But I’m left to wonder what will happen down the road if the children of interfaith families aren’t raised as and don’t identify as Jews. I respect the Roberts’ approach and their integrity. They are very serious about religion. Steve said he felt that couples getting married who decide to “just get a judge” because they have difficulty finding clergy “in most cases do a disservice to themselves.” He asks those couples to consider that they come from traditions and can find a way to reflect them – and not pretend they are neutral characters. He clearly feels that religious traditions can enrich young couples’ lives. The Robertses are not directive when interfaith couples ask their advice, either. There say there is no necessarily right way for anyone and they don’t push their model on anyone. They readily acknowledge that choosing one religion for a family and children is one way that interfaith couples can go. That is what InterfaithFamily.com has always recommended, although we hasten to add that children should learn about the other religious tradition represented in their family, and participate in it to the extent parents want them to. We talked about other subjects and we clearly had common ground in many areas, especially the need for the Jewish community to be more welcoming to interfaith couples. Both Cokie and Steve are incredibly smart and articulate – they are great spokespersons for their approach to interfaith family life. Which leaves me, in the end, still wishing that Cokie and Steve Roberts were in IFF’s camp. Everyone at InterfaithFamily.com, like most people, feels terribly about the awful attack on US Representative Gabrielle Giffords in Tucson. The violent incident in itself is not something that we would ordinarily comment about. (My personal view that there should be a huge outcry about gun control isn’t something that is an issue for InterfaithFamily.com either.) If Congresswoman Giffords didn’t have an interfaith family background, we wouldn’t have commented. But she does, and we thought it would be interest to our readers, and in part it was our way of expressing our distress. The mission of InterfaithFamily.com is to empower people in interfaith relationships to engage in Jewish life and make Jewish choices. There are so many interfaith couples that are potentially interested in Jewish life, we want to present information that will attract them to give it a try. When a person of celebrity comes from or is in an interfaith relationship and is engaged Jewishly, we want to let our site visitors know, because it may trigger interest or steps in that direction. From all accounts, Gabrielle Giffords is a very wonderful person in the public eye, who came from an interfaith family — her father is Jewish, her mother is not — and was not raised very Jewishly and yet chose to identify Jewishly as an adult. We think it’s important for our readers to know that. There is another significance to the Giffords story that is very relevant to IFF’s advocacy work for more welcoming of interfaith families by Jewish communities. Thankfully Gabrielle Giffords apparently was not greeted, when she decided to get more Jewishly involved, with an attitude that she was not welcome, she was not “really” Jewish, etc. In that regard, the Jerusalem Post ran a very important editorial yesterday. The Post, not exactly known to be liberal on intermarriage issues, basically says that Giffords should be considered to be a Jew – even though she is not halachically Jewish. Is it conceivable to exclude Giffords, another “non-Jew,” who is so unequivocally Jewish? With all our desire for a universally accepted definition of “Who is a Jew?” that would unify the Jewish people, we cannot ignore the complicated reality that many “non-Jews” are much more Jewish than their “Jewish” fellows. Congresswoman Giffords is one of them. The flip side of IFF’s work trying to attract people in interfaith relationships to Jewish life is that Jewish communities need to welcome them. It’s a shame that it takes a tragedy like this one for leading Jewish commentators to come to that conclusion. Michael Richards, Yossi Beilin and Who’s Jewish? First there was the media firestorm about comedian Michael Richards, the beloved Kramer from the TV show Seinfeld, having made racist comments at an LA comedy club. Other than being horrified as I assume most others were, I didn’t pay much attention to that news blitz, until reports started coming out that Richards’ publicist was saying that Richards considered himself to be Jewish. As reported in the Houston Chronicle, for example, Richards, though not born of Jewish parents and not having converted to Judaism, “believes in the tenets of Judaism and considers himself Jewish.” Other than a first reaction questioning whether it would be a good thing if Richards were Jewish, I didn’t pay much attention to that issue either, until a bloggers’ blitz started up arguing that Richards could not be Jewish if his parents weren’t and he hadn’t converted. That reminded me that at InterfaithFamily.com we hear many comments, usually from non-Jewish parents who are raising their children as Jews, along the lines of “I feel a little bit Jewish” or “I feel more and more Jewish as time goes by” or “I’m sort-of Jewish, aren’t I?” Rabbi Kerry Olitzky wrote a wonderful article for our Web Magazine, Doing the Conversion “Two-Step”, also included in our book, explaining how many people experience a “conversion of the heart” long before they formally convert, if indeed they ever do. Beilin said the central consideration in accepting people to Judaism by means of secular conversion would be a family tie to Jews. So while I can’t comment on the sincerity of Michael Richards’ feelings, maybe his publicist’s argument isn’t so far-fetched. Maybe he should be considered Jewish, after all.